When it comes to online dating, the first impression is the most important. That is why it is essential to make sure that your profile is appealing to everyone within the online dating community. One inappropriate picture or poorly phrased sentence could mean that you missed a potential connection with your soul mate. With the available technology at one’s disposal, there is no reason as to why you shouldn’t have the perfectly-optimized online dating profile. Use these tech online dating tips and take the necessary steps to ensure that your profile is at its best. Whether you are aiming for a perfect profile, researching dating tips for shy guys or you just want to get familiar with online dating, these are dating tips that everyone can benefit from. Notice that we didn’t say become a Photoshop master. We don’t advise altering your picture in any way that changes your real identity or appearance; however, there are other factors that can detract from your pictures. When it comes to profile pictures, one of the most common mistakes is including a friend or friends in your picture. It forces users to determine whose profile picture they are viewing. Those who use a group photo for their profile pictures receive 42% fewer messages than those who don’t. Most members update their profile picture, and never change it. Those that succeed most in the online dating community should consider changing their profile picture every few weeks. With technological advancements like Zoosk’s Carousel, an updated picture may get you reconsidered by someone who initially skipped over your profile. Most people don't have a lot of new and updated pictures around, so you’ll want to get comfortable with taking new pictures often. Cliché are the worst, and you should avoid using them in your profiles. If in your profile you put that you are “looking for that someone special” or one of your favorite activities is to “take long walks on the beach,” it’ll be more difficult to find that someone special and you’ll certainly be talking long walks, by yourself. After running your online bio through a spell checker, use Cliché Finder to rid your profile of unwanted clichés. Spelling isn’t the only way in which wordage can hurt or help your profile stand out above the rest. Using data from dating websites like Match, WIRED compiled a list of the top searching terms for those looking to master online dating. It turns out that users are searching for a relaxed and athletic vibe. The five words most commonly used in male profiles, with the highest attractive ratings, are: surfing, surf, yoga, skiing, and the ocean. For women, the top five words are: surfing, yoga, athlete, London, and NYC. Check out their complete list and make sure that you are using the appropriate keywords in your profile. Most dating websites offer a way to review your account analytics. Moreover, the good ones offer profile insight. Zoosk’s Dating Insights provides users with an in-depth look at the people who are interested in you, as well as the people you are interested in. 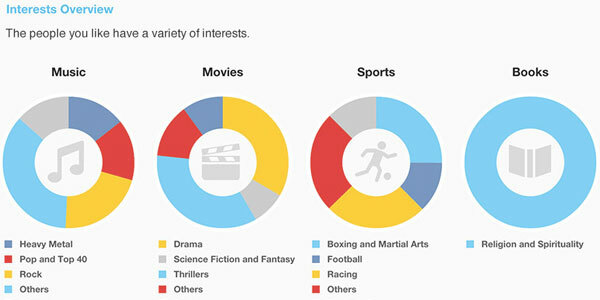 Dating Insights breaks it down by demographics, showing education, ethnicity and interests. All major dating websites, from Plenty of Fish, to SeniorPeopleMeet, recommend that you have a webcam. It enables easier chat, it builds trust amongst users in the community and it makes the chat experience more fun. Furthermore, some dating sites offer badges for your profile that prove that you have a webcam and have used said webcam to verify that you are who claim you are. Once you’ve got your webcam set up, if your online dating service does not offer said badges, make sure to add in your profile that you have a ready and working webcam. Using these profile dating tips and available technological tools, you’re certain to have a full inbox each time you check in with your online dating provider. Now that you've got a jumpstart on the rest of the new users in the online dating community, jump over to America's most successful online dating site and find true love, today!